Welcome to Rock Veterinary Clinic! 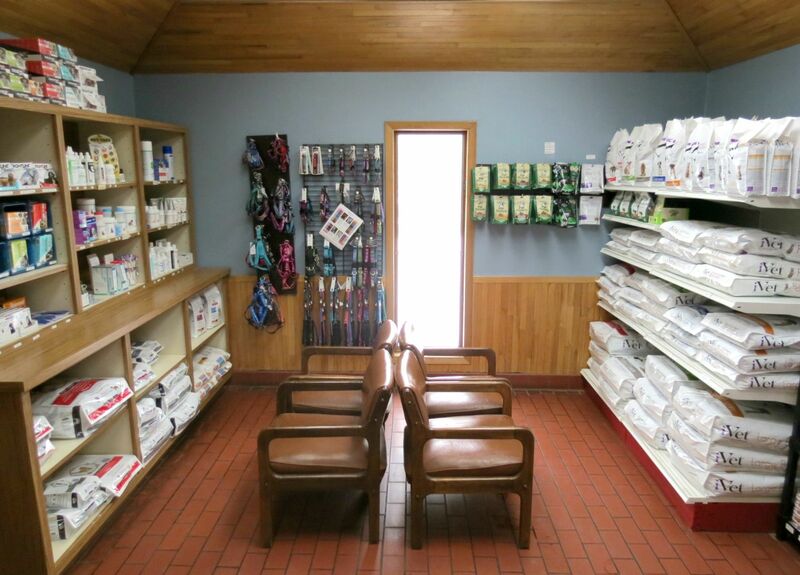 Located south of Luverne on Highway 75, Rock Veterinary Clinic has proudly served the Luverne area for over 45 years. Our small animal patients have a waiting area that features our iVet pet foods, flea and tick products, Lupine leashes and collars, and many of our medicated shampoos and conditioners. 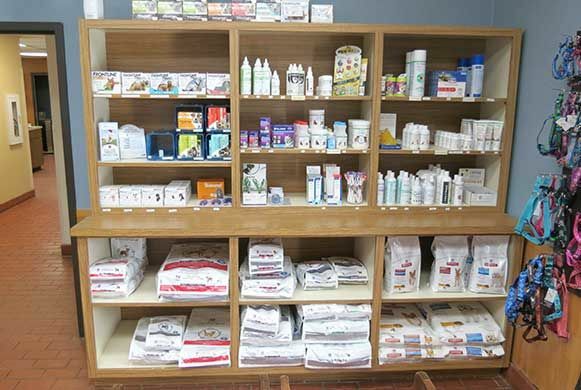 Our small animal display shelves features iVet pet foods, flea and tick products, Lupine leashes and collars, and many of our medicated shampoos and conditioners. We also carry medicated shampoos & conditioners, omega 3 fatty acids, puppy & kitten milk replacer, pill pockets, Feliway, and dental products. 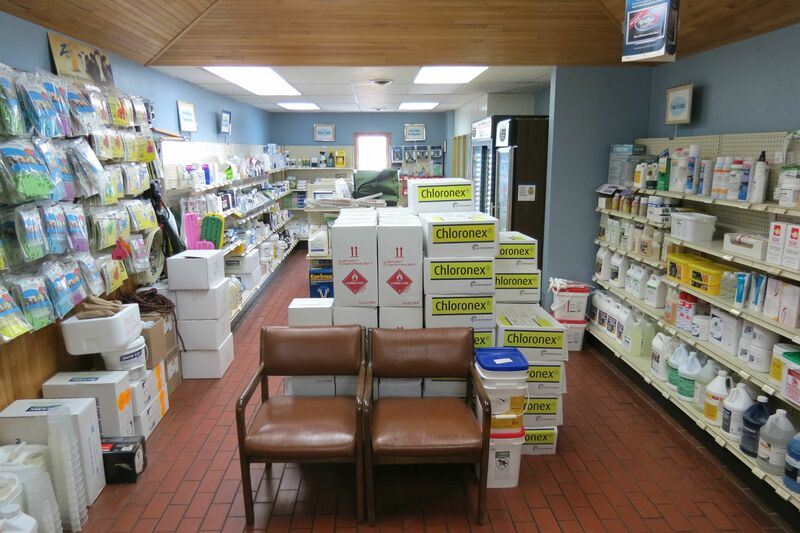 Many large animal medications, vaccines, and supplies are located in the large animal waiting area. We offer products for cattle, pigs, horses, goats and sheep. The small animal examination room provides a quiet and individualized area to fully examine your pet. Yearly physical exams are important to help monitor your pet's wellness and detect health issues before they become a problem. Call today to schedule a wellness exam for your pet. 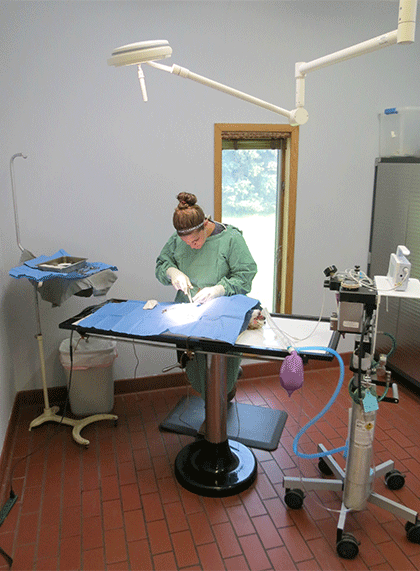 The small animal surgery suite ensures that all of our procedures are sterile. Some of the more common surgeries include spays, neuters, mass removals, foreign body removals, and exploratories. Each surgical patient is intubated and maintained on Isoflurane gas. Patients are continually monitored through the entire surgical procedure as well as post-operatively. We are able to run many tests here in our clinic. 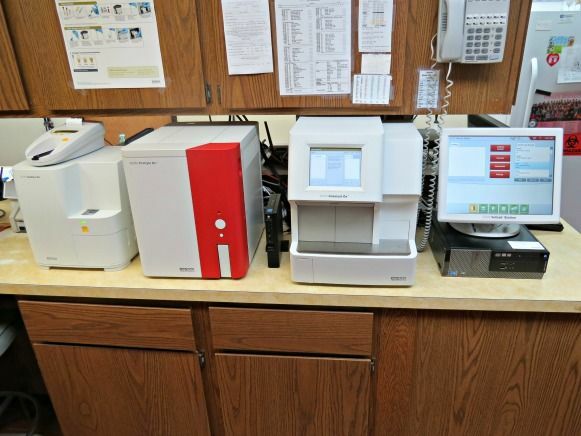 On the left is our urine sediment and analyzer machine. We are proud to be the first veterinary clinic in the area to offer high quality results of your pet's urine in only three minutes! Next is our Complete Blood Cell (CBC) machine. This tests for anemia, infection, inflammation, and the healthiness of your pets' blood cells. Then we have our blood chemistry machine, which can test organ and thyroid function, and electrolytes. The screen controls the three machines, shows pictures of urine sediment results, and stores test results. Our technicians also check lump/mass cytology and ear cytology. Rock Veterinary Clinic offers a full line of prescription diet foods for both dogs and cats. Hills Science Diet is the line of food we offer most commonly, but we are able to order specific prescription diets from other companies such as Royal Canin or Purina. Ask one of our staff members about prescription food for your pet. 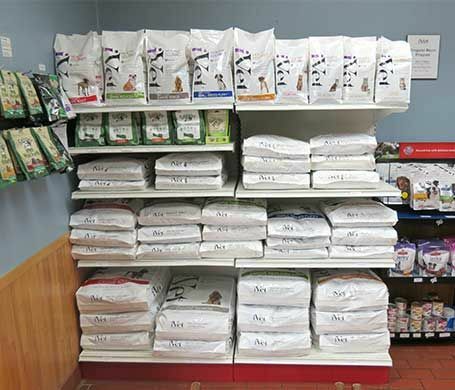 Our upgraded shelving system has greatly improved our inventory selection for our Ivet dog and cat food. Curious about Ivet food? Ask us about our food trial program. You can receive a small bag of Ivet food for just $5. Already feeding Ivet foods? Be sure to ask our staff about our volume purchase program for the Ivet foods. Buy 12 bags of Ivet food, get 1 bag free. 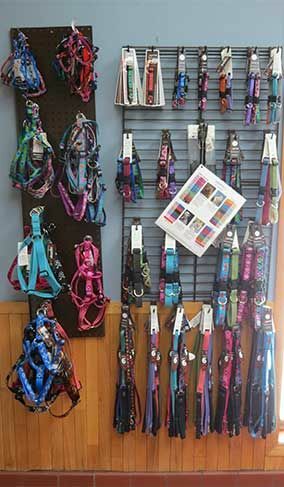 We carry Lupine collars, leashes and harnesses. They are guaranteed! If your pet chews or breaks any Lupine product just bring back a piece of it and get a replacement for free. Does your pet have bad breath? Is he or she reluctant to eat? Ask one of our staff members about dental care for your pet. Rock Veterinary Clinic features an ultrasonic scaler just like a human dentist. Our scaler allows for removal of tartar above and below the gumline. Each patient receives a tooth-by-tooth examination to check for periodontal disease, cavities, or any other lesions. Our patients are sedated, intubated, maintained, and monitored while on gas anesthesia for the entire procedure. 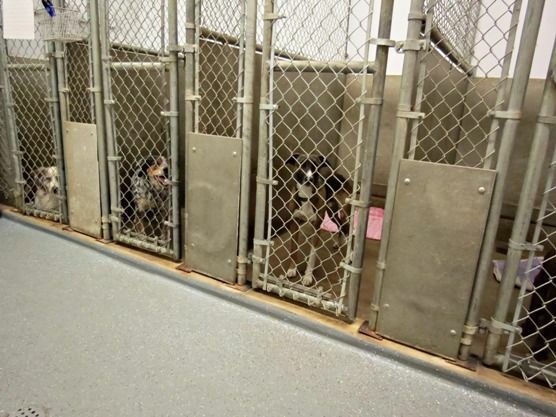 Our surgery and sick canine patients can recover in individual kennel spaces. Each kennel is fully disinfected between patients. Our feline surgery and sick animals stay in a specially designated "Cat Only" room to help reduce stress and anxiety. 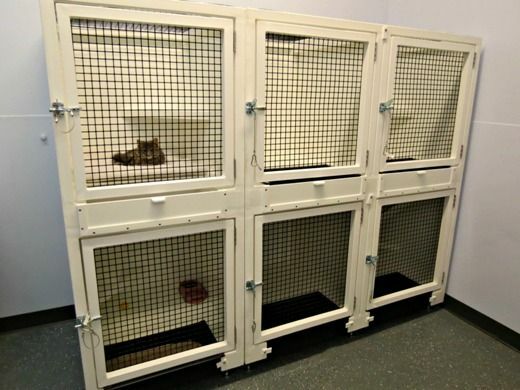 The room features a Cat Condo system which includes spacious kennels with extra ledges for cats that like a high perch. 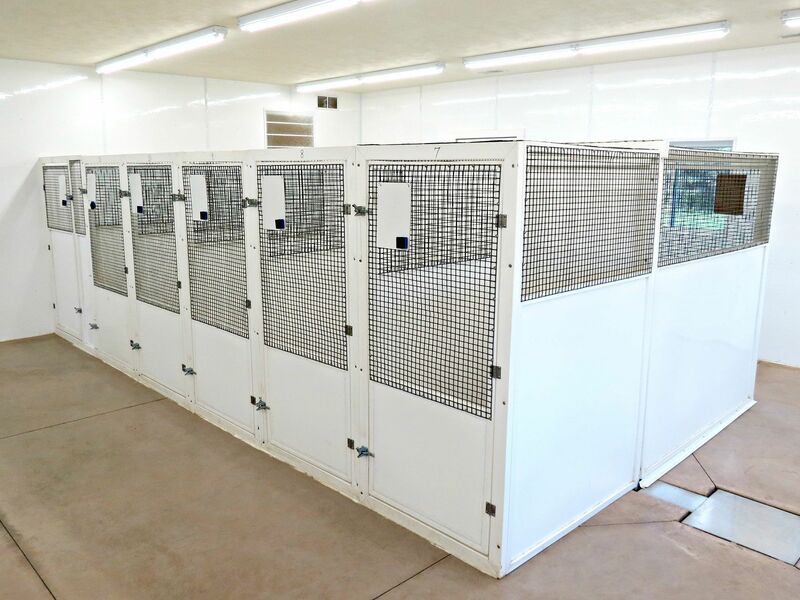 The Cat Condo system can be six individual kennels or three very large kennels, depending on how dividers are placed. Also, the Cat Condo features a drop in litter box system for cats that are recovering from surgery and cannot step up into a litterbox. Our new building has been completed! 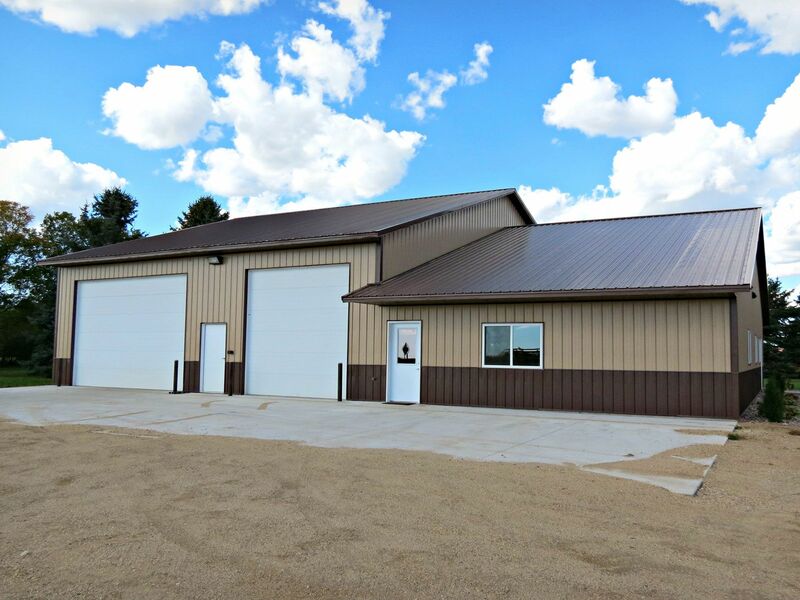 It houses both our groomers - Eve and Alyssa, canine boarding kennels, outdoor runs, and a storage area for our large animal feed. 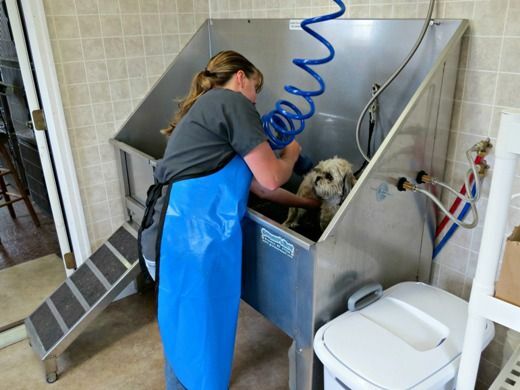 Set up an appointment today to have your pet bathed, groomed, and nails trimmed with Eve or Alyssa. Grooming is now located in our new building! The clinic features haul in working facilities. 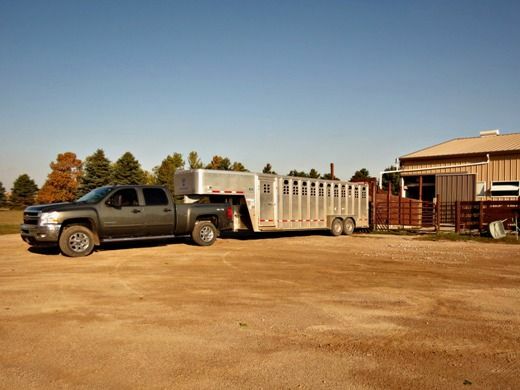 We feature both pickup and trailer load out, as well as semi-trailer load outs. We have several large pens to accommodate groups of cattle and allow clients to drop off animals to be worked. The clinic has the ability to load and unload semi trailers. 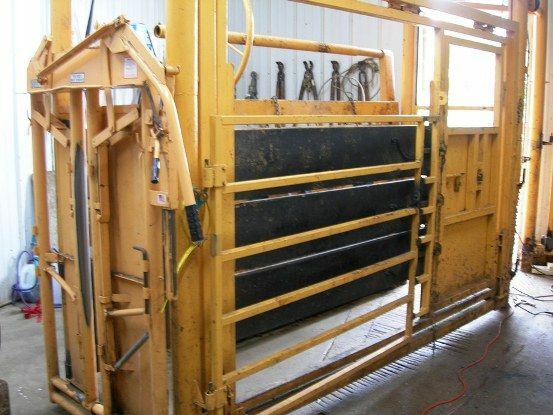 Our hydraulic tilt table works great for trimming feet or treating toe abcesses on cattle. We trim hooves on lots of animals each year. We are able to correct many foot abnormalities. We have upgraded our main working facility to include a scale for weighing cattle. With the scale we can provide our producers with weights on all the animals we work. Additionally the scale will help to more accurately measure and dose animals with deworming products as well as antibiotic injections. The scale features a Tru-Test Scale Reader. Ask us today to weigh your calves at fall processing. Curious how much your breeding bull weighs? 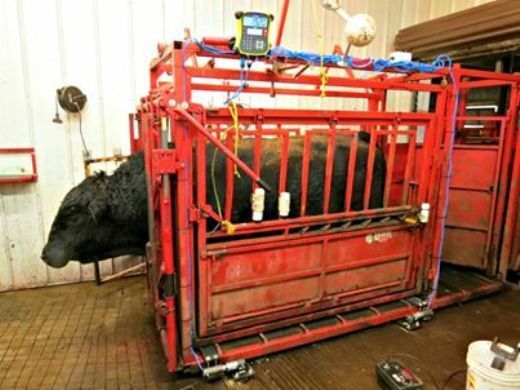 Bull weight is included with a pre-breeding fertility examination. 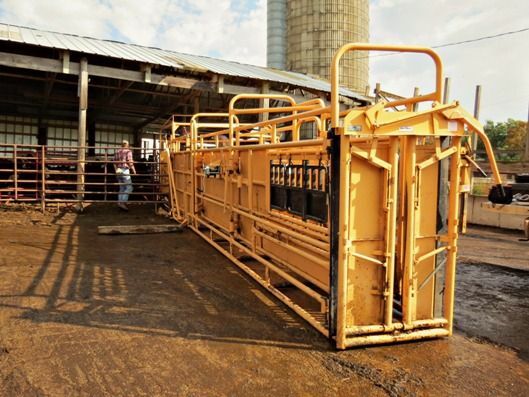 The working facility features an adjustable alley to allow handling of any size of cattle. The alley width is adjustable from 19 inches up to 29 inches wide. 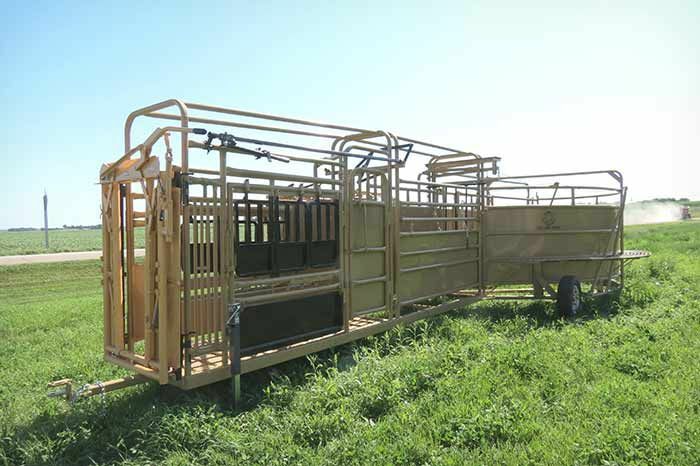 This allows us to safely work newborn calves all the way up to pregnant cows and breeding bulls. Rock Veterinary Clinic has an ultrasound machine for early pregnancy detection in cattle, sheep, and goats. 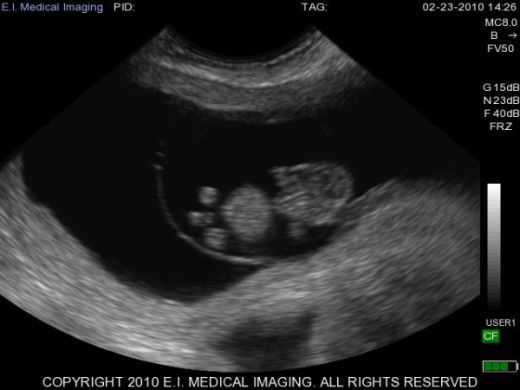 Because the machine is portable we are able to perform ultrasounds both in clinic and on farm. This image is of a 40 day bovine pregnancy. Many of our prescription antibiotics for large animals are located in our back storage area, along with most of the water medications for swine. Rock Veterinary Clinic has two portable chutes and a portable tub/alley system with a chute. 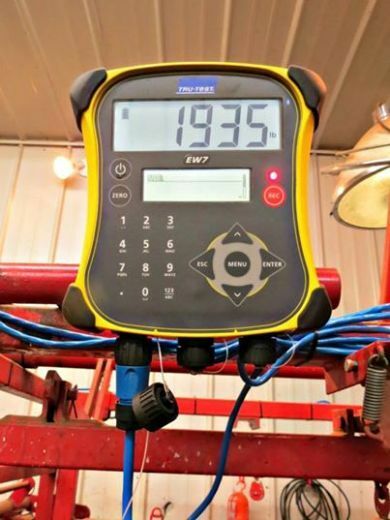 These allow for safe and easy on farm working of cattle. 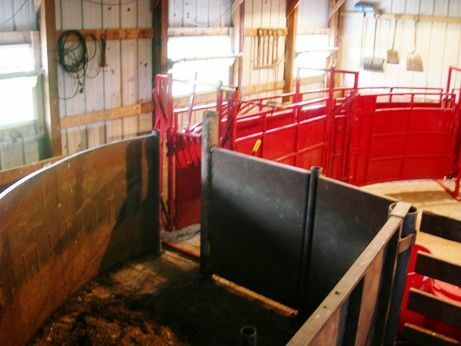 The clinic has a portable For-most Cattle Tub, Alley and Chute. We are able to bring this out to farms for cattle work and offer it for rent as well. Rock Veterinary Clinic is a dealer for For-most Livestock Equipment. Call us today for prices on a new tub, alley or chute. Adequate dental care is a vital part to your horses care, no matter the age of your horse. Yearly dental examinations should be performed as part of your routine yearly horse care. Senior horses should have their teeth examined bi-annually to quickly correct any problems that may come up. This horse is having its teeth floated to correct overgrowth. 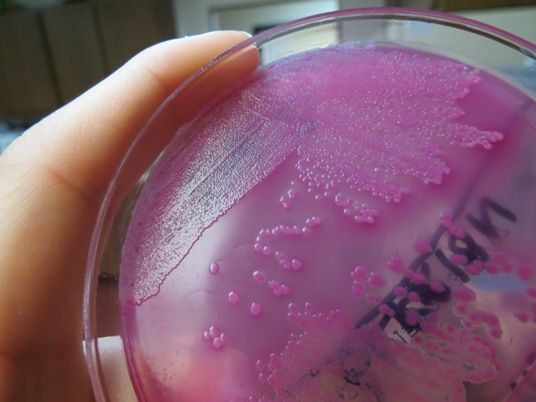 We also have the ability to culture tissues from pigs, cattle and goats, and grow many different types of bacteria that may be causing sickness or death in our clients herds. We can also culture urine or ear debris from our small animals. In this picture we grew E.coli from a pig.